This is a region-free DVD-R without case or artwork. See main page for details. In German with English subtitles. 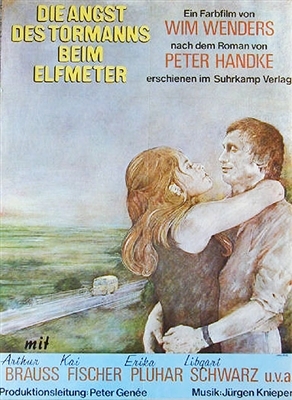 The Original German title of the film is "Die Angst des Tormanns beim Elfmeter." A loose adaptation of a novelette by author Peter Handke, this early effort from acclaimed director Wim Wenders follows penalized goalie Joseph Bloch (Arthur Brauss) as he makes his way through the city after missing penalty kick and getting suspended from a game. Wandering by a local cinema, Joseph picks up the pretty cashier and the two spend the night together. Inexplicably strangling the girl in the light of the morning, the seemingly unaffected Joseph makes his way through the city streets as emotion begins to boil under the surface of his stony gaze. Making his way to an old girlfriend's house in the country, the emotionally shattered goalie has little to do but wait for the police to close in on him.